This group of particles is from an oil sample collected from a 8400kVA transformer. This transformer was reportedly gas blanketed and sealed. 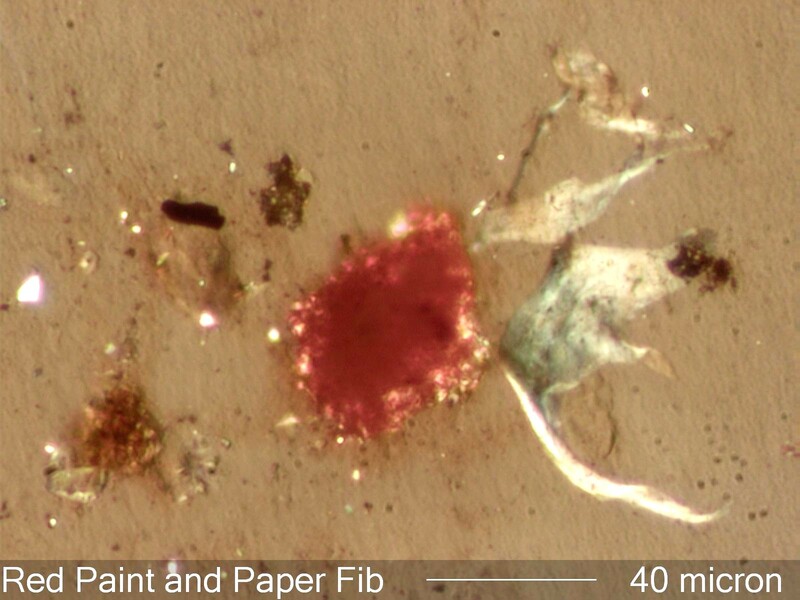 The redish flake in the center of this image is red paint. Paint consists of a clear polymer matrix (the vehicle), pigment, and mineral fillers and bulking agents. All are evident in this particle. The filler particles are the bright particles most easily seen near the edge of the paint particle. There are a number of degraded paper fibers in this field of view. These paper fragments have a degree of polymerization below 200. .
Large numbers of degraded paper fibers indicates degradation of the core insulation.